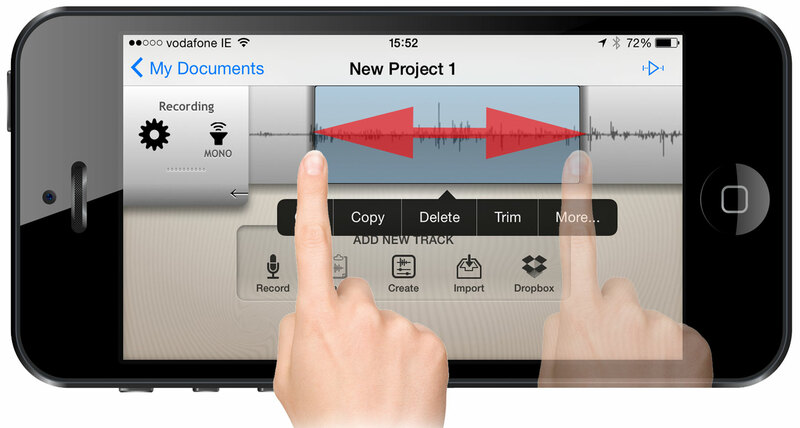 Hokusai is a multi track audio editor for IOS which is very powerful. Aside from the core feature of multi track audio it also supports the Sonomo Audio Copy/Paste feature which can “bridge” the sandbox between Apps allowing you to move audio clips/files from one App to another. Its also supports the Apple OPEN IN protocol – both of these features mean you can easily import and export audio clips between other Apps like Twisted Wave-One of my other favourite Audio editing Apps. Hokusai is free to download from the App Store but in fact to get the full use of it you need to purchase advanced features in App. If you buy all the features you get a “All-In Bundle” for €8.99. I checked the Developers Website Wooji-Juice.com to see if there were any tutorials for the App or to download the manual. There are tips on the site but to get the manual you have to email the developer via the contact page on the site. I did this yesterday and he kindly and quickly sent it to me. If he grants permission I will link to it here. The only issue I had is the manual is quite “wordy” : (11 pages) with no illustrations or images so, being a visual learner I decided to create CheatsSheets like those I’ve created for iMovie previously.